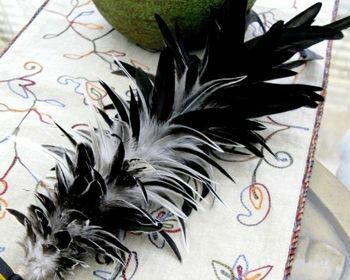 Lei Hulu (feather lei) is a unique and excusive artwork. 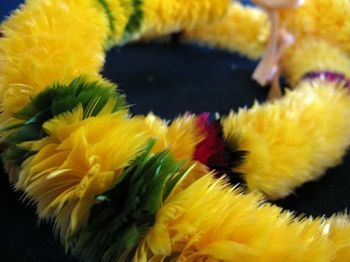 People may know the cultural background of feather lei; however, feather lei are still not as popular as other forms of art such as performing art or lecture. 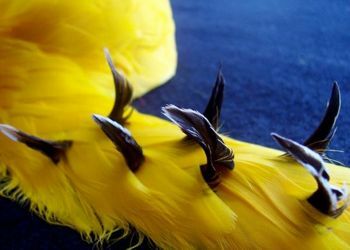 I would like to use my creation and feather lei making skills to raise awareness of Hawaiian feather art, and reestablish its’ status beyond its cultural background. I always believe that people can see, and feel what is the thought behind the artworks. What make my feather artworks different than others is because there’s skill passing and culture crossing from two different ethnic, there’s love, encouragement and home for a stranger like me to settle in, and there’s respect of this land and culture. When you open your eyes and mind to experience different cultures, as long as you have your heart in it, people will see and feel the beauty of you. An apprentice of renowned Hawaiian Feather Lei Master, Aunty Mary Lou Kekuewa. 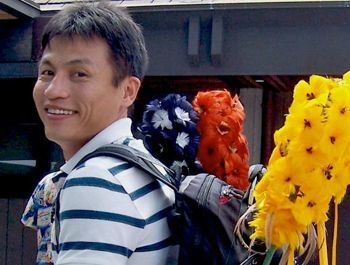 Mr. Huang creates his own lei hulu patterns by using different colors, (both dyed and natural colors) and types of birds (such as goose, pheasant, duck and peacock etc.) with many styles ranging from traditional styles to contemporary designs. He often designs lei hulu for special people and events. Boris’ lei hulu have appeared in many fundraising events for organizations such as Hawaii Theatre Center, Manoa Valley Theatre, Temari - Center for Asian and Pacific Arts, Halau Na Kamalei, Halau I KaWekiu, artist Peggy Chun’s fundraiser, Honolulu Symphony and many more. Commissioned Award creations include Hawaii Education Association, Manoa Valley Theatre annual honoree, Wells Fargo & Co., Goodwill Industries of Hawaii Inc., Hawaii Tourism Authority, Waikiki Outrigger Hotel and many others. Boris has participated in a number of public events such as Hawaii pacific University Gallery Exhibition 2007, 2008 & 2009. First Mixed Media Festival 2009, Annual Moanalua Gardens’ Price Lot Hula Festival, Day at Queen Emma Summer Palace, Textile Society of American Biennial Symposium 2008, and as demonstrator in a TV program, Scenic Hawaii on HD channel 1000; Oahu story, feather lei. 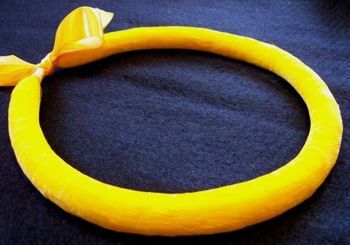 Many well known personalities own and wear Mr. Huang’s lei hulu including actor, Jim Nabors; Princess Abigail K.K. Kawananakoa; Honolulu Mayor, Mufi Hannemann; Hawaii Theatre manager, Burton White; performer andkumu hula’s, Robert Cazimero, Aloha DeLire and Tony Conjugacion; singer, Cathy Foy; and many more.